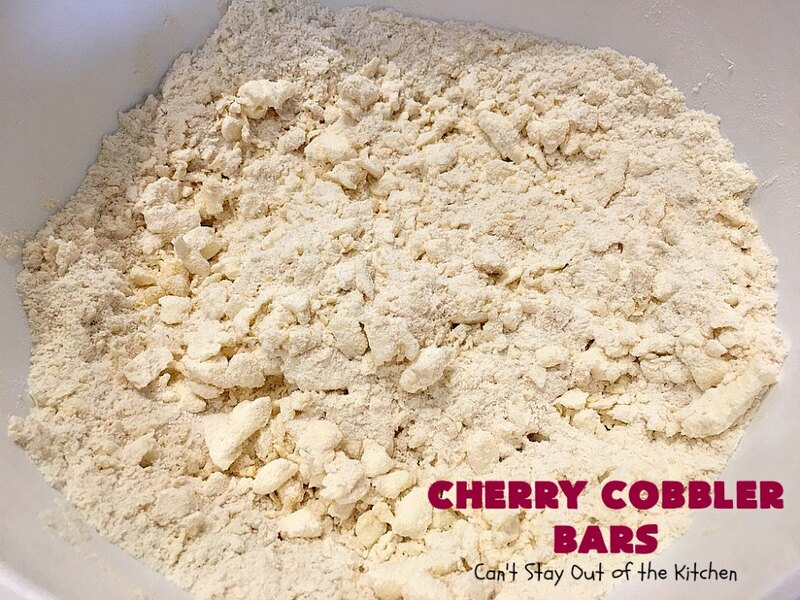 Back in May, I was asked to be a “Canbassador” and reviewer for Northwest Cherry Growers in Washington state. 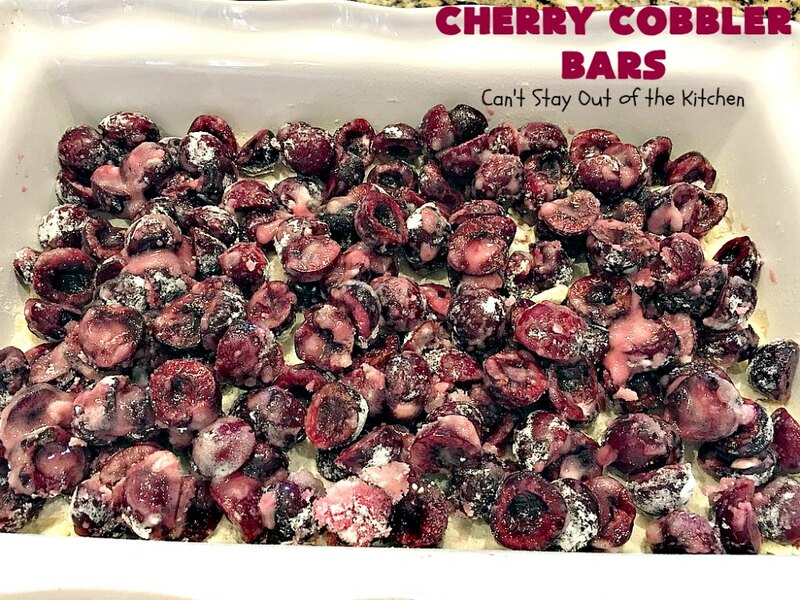 While no money was exchanged, I did receive 20 pounds of fresh, plump irresistible cherries. These cherries were massive. 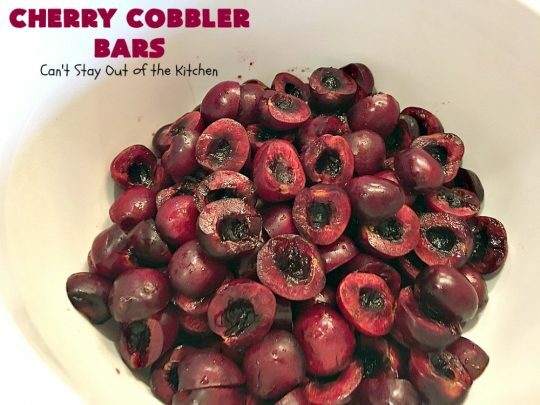 They were so enjoyable to eat plain, but I made ten different desserts out of them. 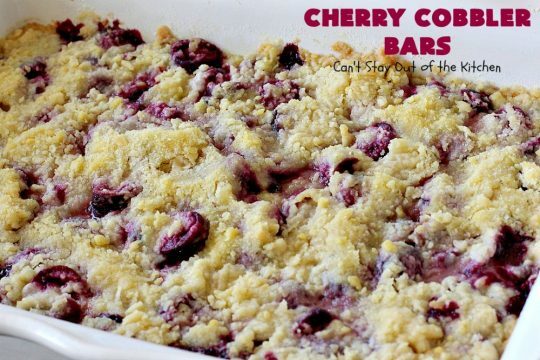 Those desserts included a Cherry Crumb Coffee Cake, Cherry Cream Cheese Pound Cake, Southern Cherry Cobbler, Cherry Melt-in-Your-Mouth Cookies, Cherry Almond Ooey Gooey Blondies, Cherry Cobbler Cookies, Cherry White Chocolate Chip Blondies, Cherry Pie Bars, Cherry Crumb Bars and these delicious jewels. 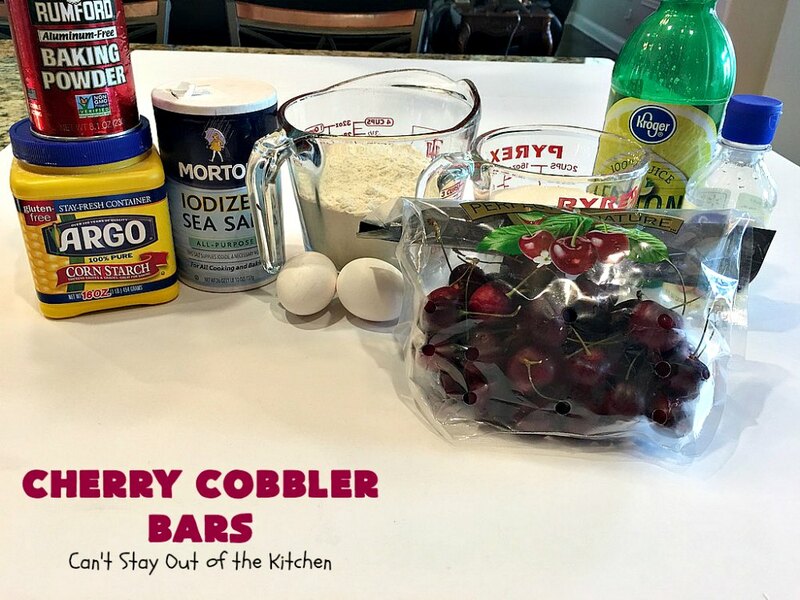 If you’re looking for a fantastic summer dessert, Cherry Cobbler Bars need to be on your “to try” list. 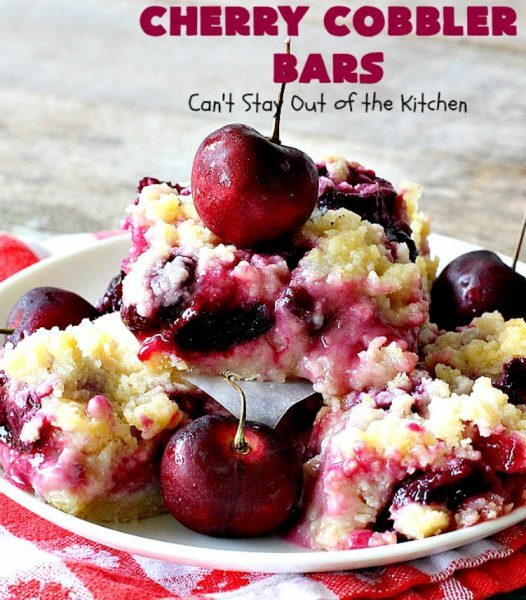 These cherry-filled bars will knock your socks off–and I’m pretty sure you’ll have no leftovers after you serve them. 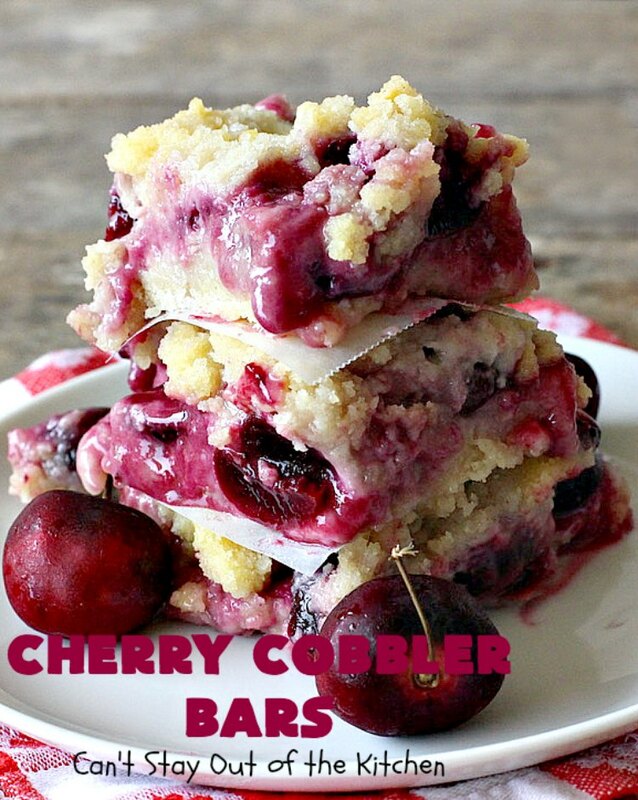 Cherry Cobbler Bars are amazing. 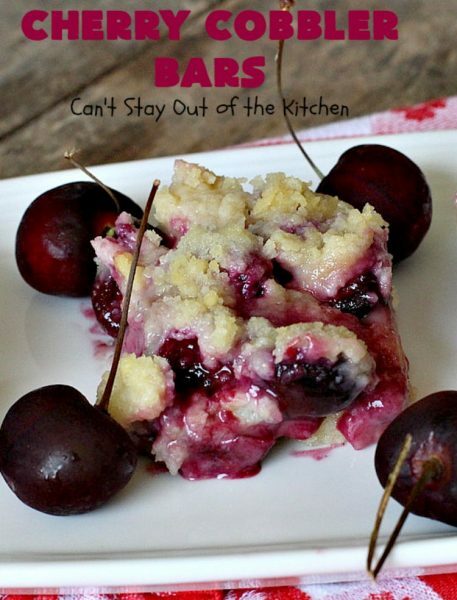 Cherry Cobbler Bars make a terrific dessert during the summer when fresh cherries are in season. 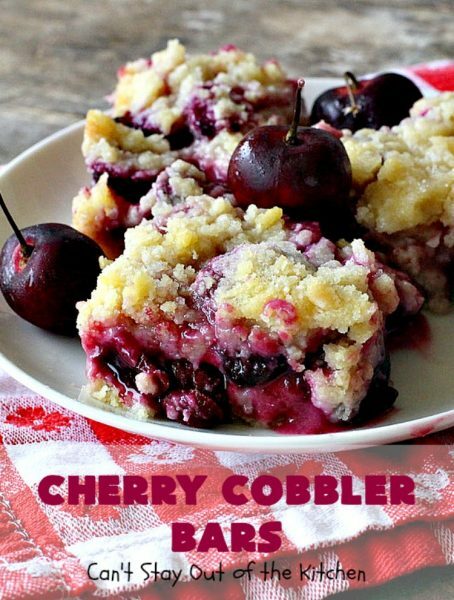 This ooey, gooey dessert combines the wonderful flavors of cherries and almond extract. If you enjoy cherries, Cherry Cobbler Bars needs to be on your dessert list! Combine UNBLEACHED flour (bleached flour toughens baked goods), part of the sugar, baking powder and salt. Add egg yolks, part of the lemon juice and part of the almond extract. Stir to combine. 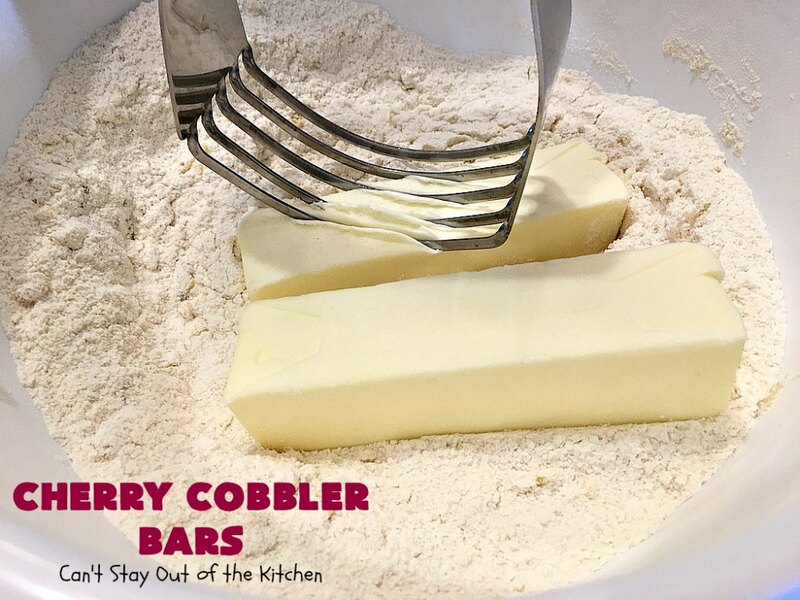 Cut butter into flour mixture until coarse crumbs form. 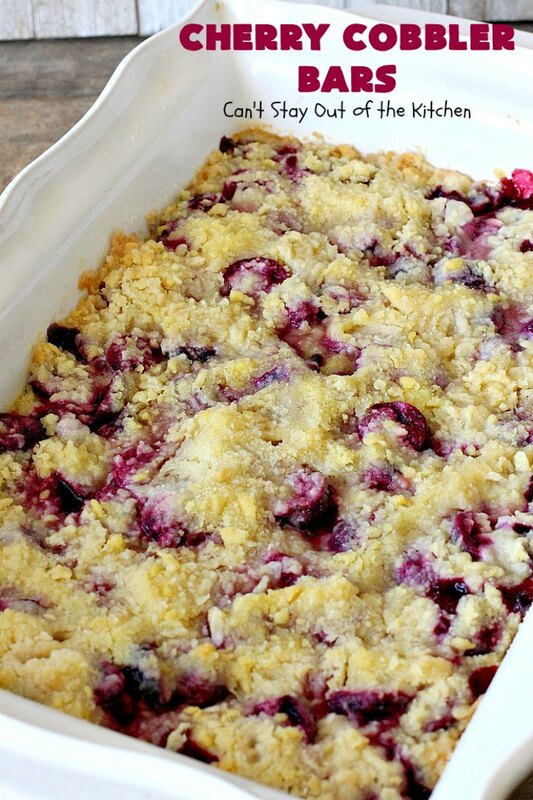 Place half of the mixture into a greased 9×13″ glass baking dish. Halve and pit cherries. Pat dry with a towel. Place in a large mixing bowl. 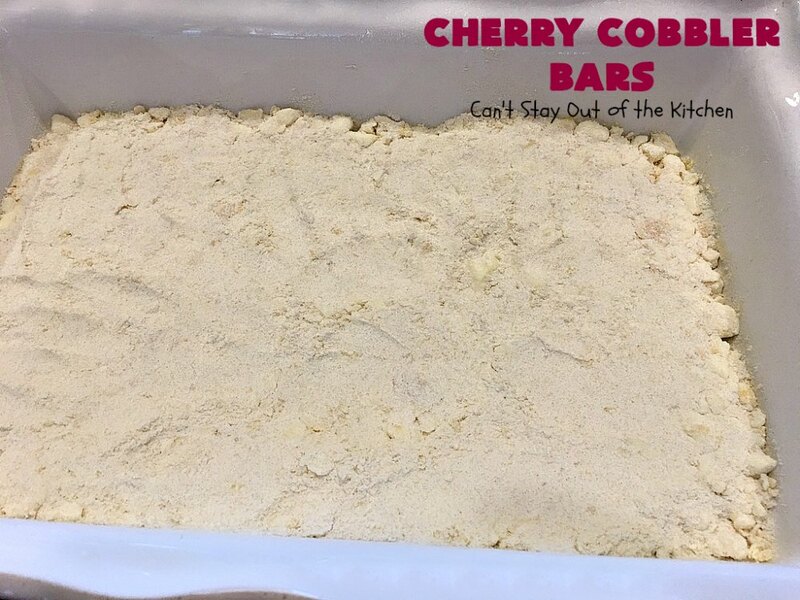 Add remaining sugar, cornstarch, remaining lemon juice and remaining almond extract. Stir ingredients to combine. Allow cherries to sit out for 5 minutes to absorb flavors. Pour cherries over crust layer in baking dish. 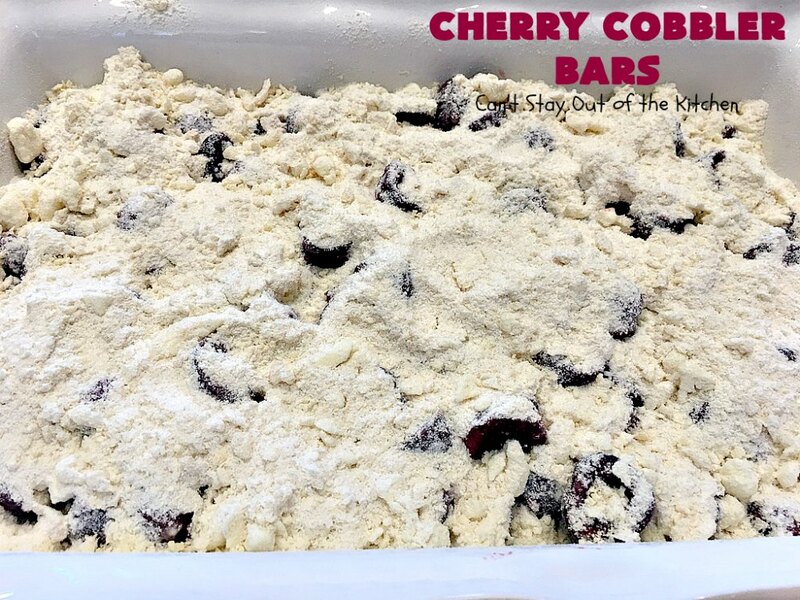 Sprinkle remaining half of the crust mixture over top of the cherry layer. Bake at 350 for 50-60 minutes or until golden. Cool completely before cutting into bars. Cherry Cobbler Bars are sure to cure any sweet tooth craving you have! 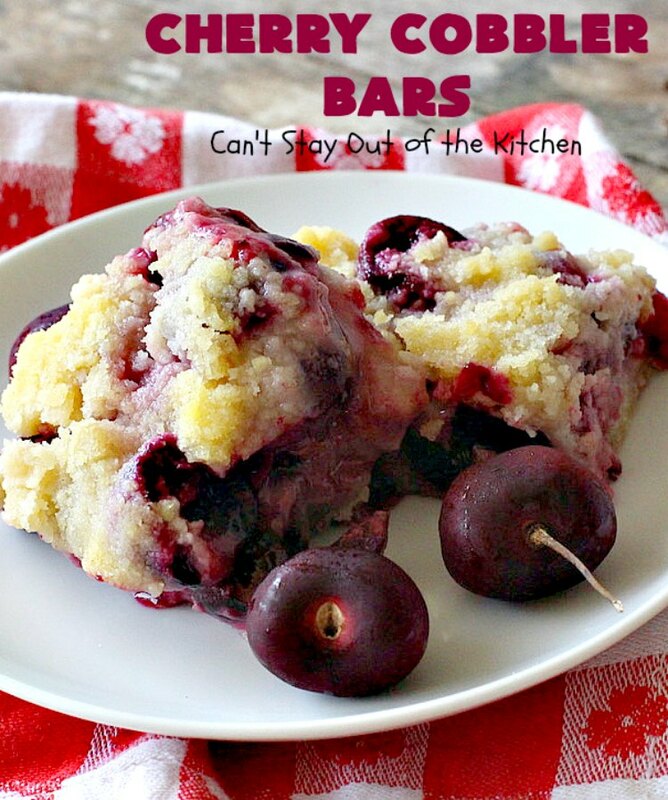 These cookie-type bars are so mouthwatering it’s hard to stop eating after only one! Cherry Cobbler Bars are terrific for summer potluck parties. 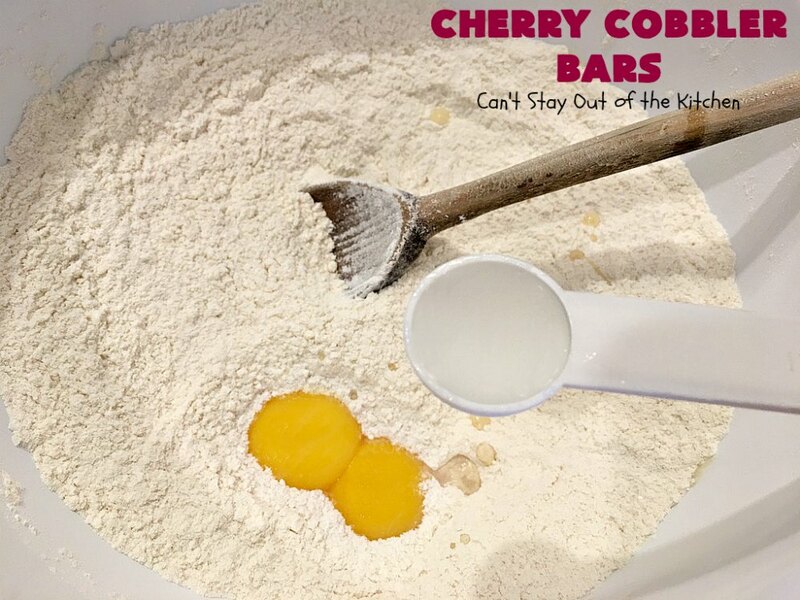 These bars are so heavenly. 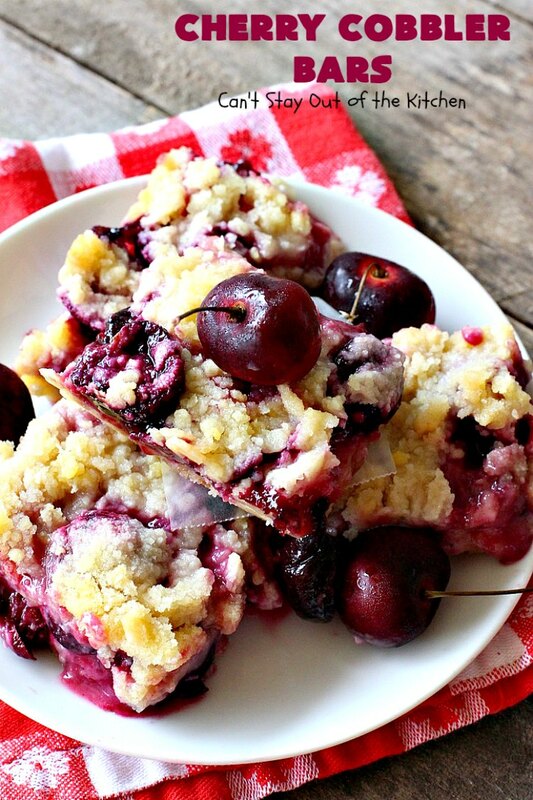 Cherries and almond flavoring are perfect together. These spectacular bar-type cookies are filled with fresh cherries and almond extract. It is like eating cherry cobbler but in cookie/brownie form. 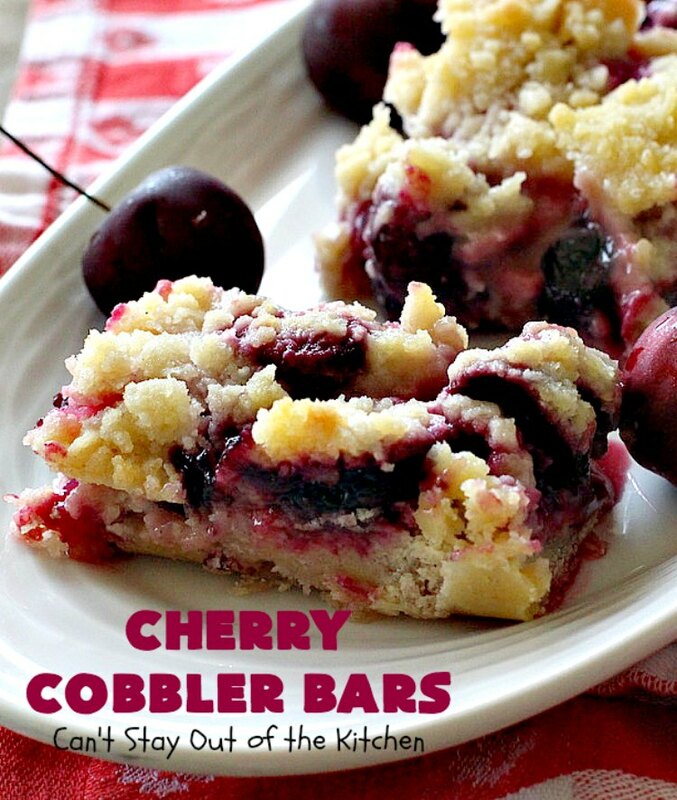 Cherry Cobbler Bars are ooey, gooey and so delicious. These tasty treats make for a delectable dessert for summer potlucks when cherries are in season. You won't want to put them down! 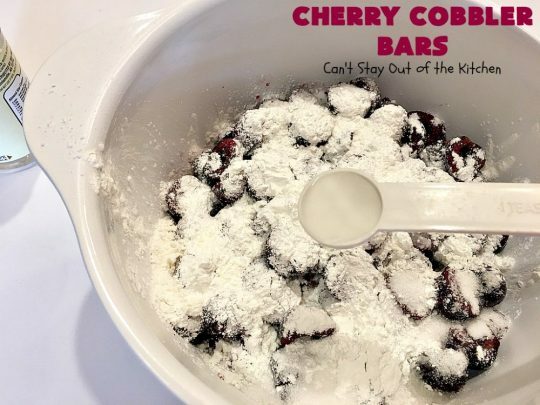 Combine 1 cup sugar, baking powder, flour and salt in a mixing bowl. Add yolks, 1 tsp. almond extract and ¾ tbsp. lemon juice. Press half of the mixture firmly into the bottom of a greased 9x13” baking dish. Place cherries, remaining half cup sugar, cornstarch, remaining teaspoon of almond extract and ¾ tbsp. lemon juice in a small bowl. 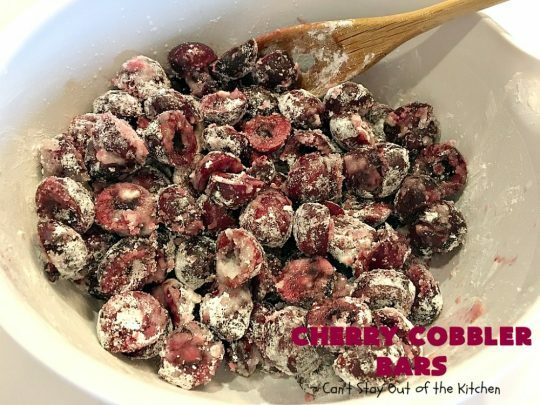 Allow cherries to sit and soak in mixture for 5 minutes. 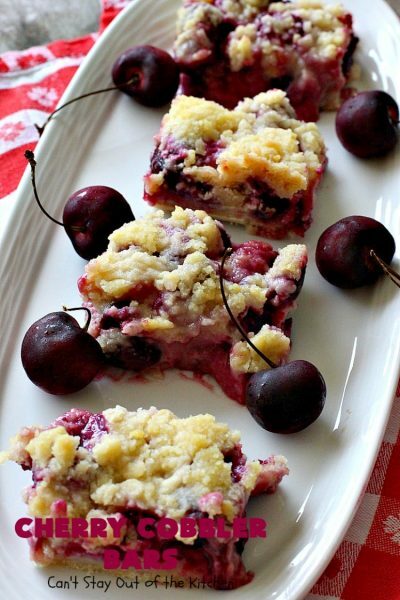 Layer cherries over top of crust layer. Sprinkle remaining crust mixture over top of cherries. Bake at 350° for 50-60 minutes or until golden. 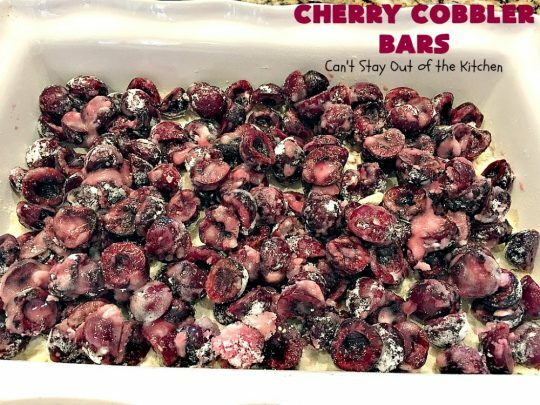 NOTE: Preparation time can be cut down considerably if you use a cherry pitter. NOTE: To make cutting into bars easier, you may want to refrigerate the bars for a couple of hours. 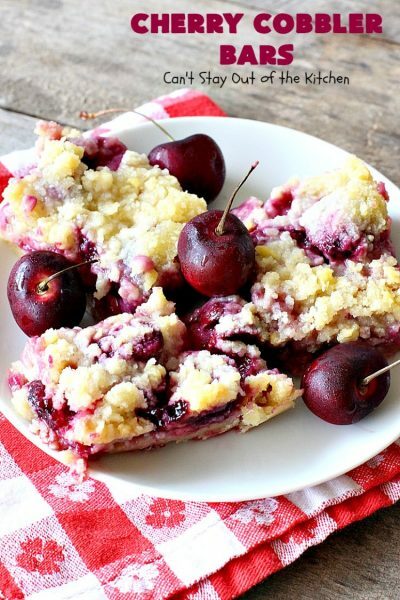 These plump cherries from Northwest Cherry Growers did the trick!